Brazil: 12 children killed, 18 injured. Britain: 52 killed, 770+ injured; 12 killed, 11 injured. China: 24 killed, 143 injured. Czech Republic: 9 killed, several injured. France: 12 killed, at least 20 injured; 8 killed, dozens injured. Germany: 18 killed, 6 injured; 15 killed, 2 injured. Israel: 4 killed, 5 injured. Japan: 7 killed, 12 injured; 8 children killed, 15 inured. Netherlands: 7 killed, 11 injured. Norway: 92 killed, dozens injured. Serbia: 13 killed, 2 injured. Spain: 191 killed, 1,800+ injured. This is not an attempt at an exhaustive list, of course. A more comprehensive listing can be found here. It is reasonable to assume most, if not all, of these countries have much tighter gun control laws than the United States, yet evil people have found ways to circumvent them and carry out their murderous intent with or without firearms. 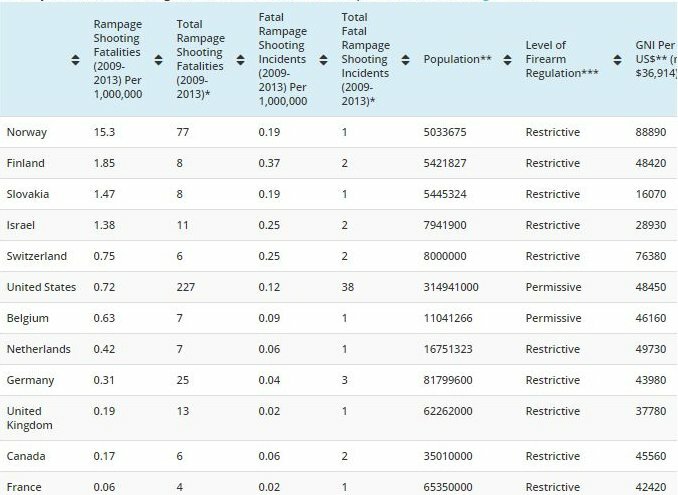 This list does not even include incidences where the death toll could have easily been higher but in pure happenstance did not meet the minimum threshold for the FBI’s mass murder criteria (e.g., Australia, Austria, Canada, China, Denmark, France, Sweden, etc.). Perhaps the worst part of these incidences is that in many cases the victims’ governments preemptively robbed them of the human decency of a fighting chance. But seeing as this latest gun control issue is specifically centered around mass shootings, vice any old type of mass murder (which apparently does not qualify as being evil enough to discuss in some circles), the following graphic clearly illustrates that the United States is somewhere in the middle of the pack, so to speak, among “advanced countries” when adjusted for population – despite being far and away the world’s leader in firearms availability per capita. 1 For the purposes of this quick analysis and to maintain consistency, the FBI generally defines mass murder events as those involving at least four victims in a single event. This entry was posted on June 21, 2015, 12:39 PM and is filed under Gun Politics. You can follow any responses to this entry through RSS 2.0. You can leave a response, or trackback from your own site.